There has been a lot of talk in the American druid scene in the last few years about establishing sacred spaces, creating sacred groves, and really staring to re-enchant our land here. I think druids and other earth-centered spiritual traditions around the world, particularly those living in places shaped by colonization, face these same challenges: how do we create our own sacred spaces? What does that look like? I wrote earlier this year, for example, about Stones Rising at Four Quarters farm, and the raising of standing stones. A few years ago, I’ve also written a series on sacred sites in the US and how to build some sacred sites. This post continues those conversations. In my Stones Rising post, I talked about how establishing sacred spaces, as a community, was certainly an “American” challenge because of the history of colonialism and the genocide of native peoples here. I commented how we were living on “someone else’s sacred land.” And there is certainly truth in that statement. However, upon further reflection and meditation, I think this statement is much more complicated and problematic. Here’s the thing: as long as we think about the land where we were born, and where we live, as someone else’s sacred land, it continues to be inaccessible/unavailable/distant from us. We feel like we are outsiders, inhabiting a place to which we do not belong. And the truth is this–we are here now, we are working to rebuild, we are working to reconnect, working to understand the sacredness of nature, her magic, her medicine. If we work to create sacred spaces, learn about ecology, uses of plants, and so on (a lot of stuff I advocate here on this blog), I think that this kind of work very much honors the ancestors of the land and the relationships they had with the land. In other words, we learn the land, we let the land teach us, and we connect with it on the deepest levels. Obviously, its not ok to visit someone else’s sacred site and claiming it as your own–that is cultural appropriation. What is also inappropriate is not acknowledging the many ancestors of the land who came before–we have to recognize what happened here, on this soil, and help the land and spirits to heal. Given these two points, I believe that what we need to do is forge new connections for a new time. We have to build, from scratch, both our relationships with the land and the sacred spaces we need to honor the land. And yet, “re-enchanting” or our land, so to speak, and connecting with it is a multi-generational process. It will take lifetimes of work, generations of people, individuals and groups. But I believe that work begins here and now–and for many of us, has already begun. The danger of not creating sacred spaces and making this land our sacred land means that we will never be fully connected to it. The danger of not seeing the land where you were born as your own means that you have no place to call home. So in today’s post, taking this “sacred space” concept more to the practical level, I’d like to explore the work of establishing a piece of land, of any size, as sacred land–that is, establishing and maintaining a permanent sacred space, a sacred sanctuary, a place of magic, contemplation, reflection, and renewal (and many other things). This post coincides with my purchase of new land and my own moving to a new home, and so I’ll use myself as a case study. What do I mean when I say “sacred land” or a “sacred landscape”? How is it different than a “sacred site?” In both cases, we are cultivating a relationship with the land, but the scope of that relationship differs. The way that I see this distinction is as follows. Sacred Sites: We can establish a sacred site, like a stone circle, sacred garden, shrine, altar, and so on, as a stand-alone space. These are single constructions that offers a particular kind of blessing to the land or has another kind of use (or series of uses). They may be hidden away or created in a place that has many different purposes. The point here is that something is set aside for purposes only to be used as sacred (like a stone circle). 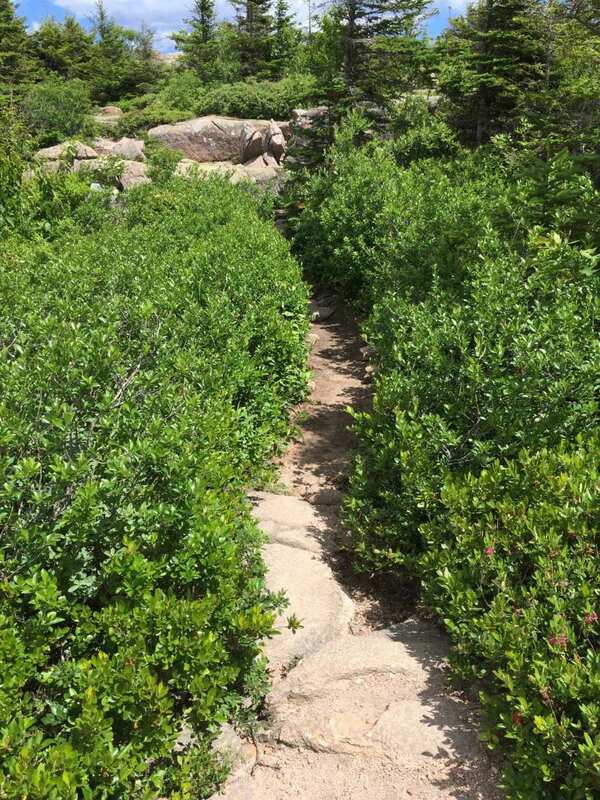 Sacred Landscapes: When I say sacred landscape or sacred land, I am talking about a potentially larger piece of land with many smaller sacred sites/spots/items contained within it. The idea here is that the entire piece of land or property is a dedicated sacred place where you can engage in various kinds of sacred actions to reconnect with nature. It is certainly a step above a single dedicated space, but rather, We have some public examples: Circle Sanctuary, Four Quarters, Dreamland. But any person can choose to do this as well on a smaller piece of land of their own–and it is to this work today that I will begin to attend. One metaphor you might think about this ties to permaculture design. I might create a small raised bed for raising veggies and focus my efforts solely in that direction, or, I might create an integrated design that had many different kinds of features including an orchard, herb garden, outdoor kitchen, butterfly garden–the whole design, which took years to enact, works together as a cohesive whole to meet a variety of shared purposes. A sacred shrine is like that single raised bed growing tomatoes. A sacred landscape is the entire design, working together, to feed, house, and nurture all who call that place home. So how does this look in practice? This will be my second time working to create a sacred sanctuary, and I’ve learned a few things along the way, but I still have a lot to learn! And so, over a period of time as I create the space, I’m going to walk through the process sharing how I am transforming my new 5 acre land land into sacred land–energetically and physically. In order do that, I want to offer some background on where I’m coming from and where I’ve been. 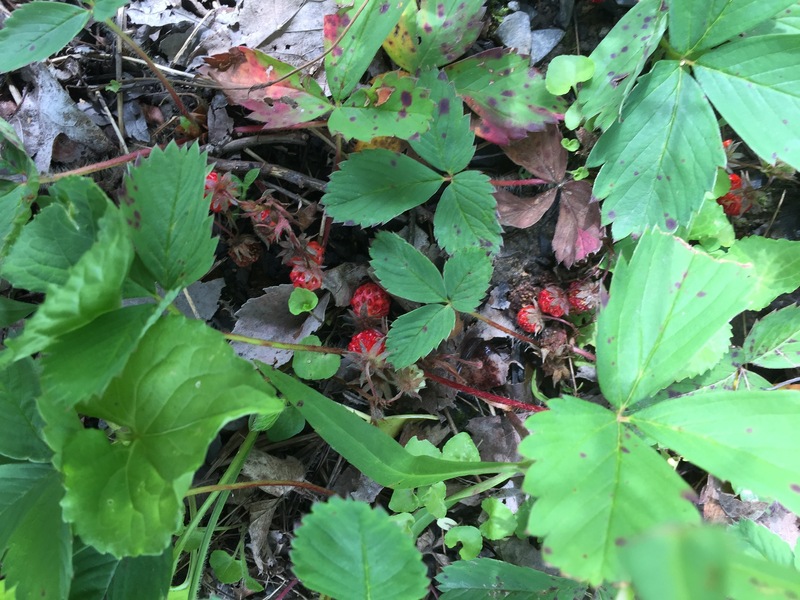 I lived on a 3-acre homestead in Michigan for 5 years (the beginnings of this blog) where I first intuitively learned some of what I’ll share in this post series. Then, 2.5 years ago, I returned to Western Pennsylvania, the land of my ancestors, for a new job and to be much closer to my family. 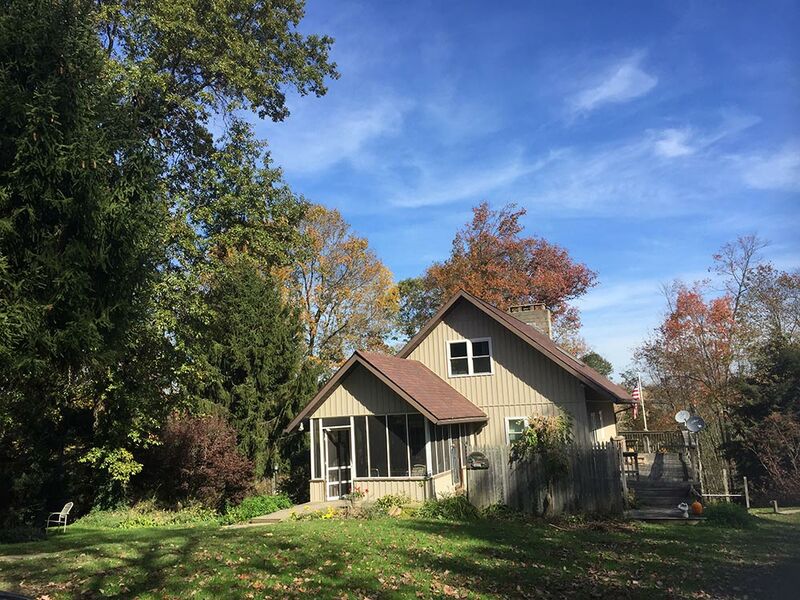 It was a bit of a jarring shift–after working for five years on land both physically and energetically, and transforming it into a druid and permaculture oasis, I was stuck in a rental situation in a small town. And yet, some of my deepest insights of my druid path came from this work. I had no home base. All the land became the land to which I belonged. 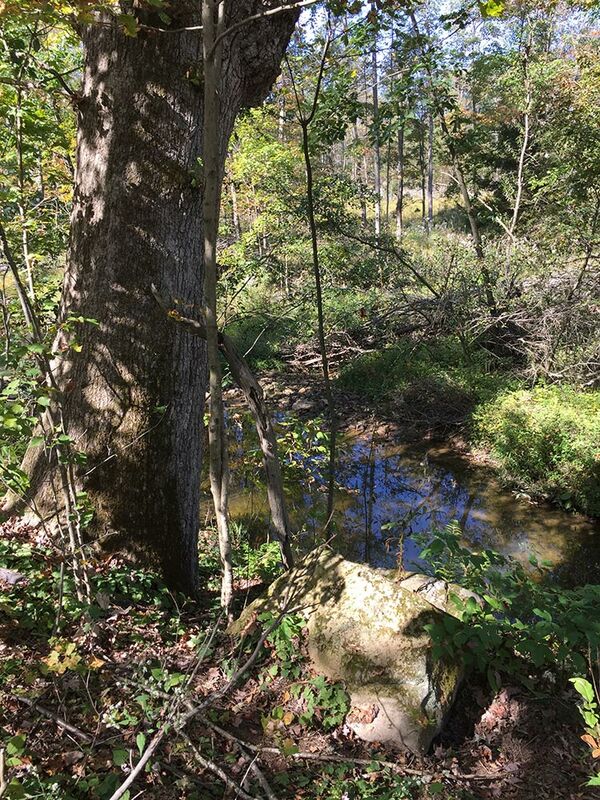 Having signed the paperwork making me “the owner” of the land this past week raises all kinds of issues surrounding creating sacred land–and these are useful to explore as part of the process. In truth, the profit-driven western world has encouraged a line of thinking that implies that we humans are the only agents of change in the world–we have the power, we have the control. There is this underlying assumption present, particularly with nature and life other than our own, that we can just do what we want. Of course, the modern conception of ownership of land solidifies the problematic “do what pleases you” thinking. I just signed paperwork that says I can do just about anything I want to this land, short of some legal issues (like dumping raw sewage on it or building new structures without a permit). But in terms of what I might do to the trees, to the plants, to the ecosystem–beyond “lawn maintenance” there are no laws for that. I could cut it all down, I could let it grow up–because I now “own it” the land is mine to do with what I want. And for the record, I don’t really think this is about laws, what is legal or no. What it really is about is mentality, mindset, approach, relationship. I have a druid friend who is a landscaper, and he tells me how prevalent this attitude of “shaping nature to my will” is when he is working with clients on their landscapes. Most of the time, the attitude is “I want it to look nice” and by “nice” it means “in control.” He told me of a woman who owned a beautiful property and wanted to cut down a bunch of trees for no real purpose. He tried to talk to her about stewardship, asking about the people who would own the land after her…and it went over like a lead balloon. People don’t see themselves as stewards of the land, they see themselves as “owners.” The most salient story I have ever read on this topic was in Robin Wall Kimmerer’s Gathering Moss book. It was a later chapter in her book called, “The Owner.” I think everyone should read it–it was a shocking and horrific story about ownership and what people will do to bend nature to their will tucked in an otherwise wonderful book about mosses and how they grow. This “ownership” is from this same place and line of thinking that so many of the atrocities that are committed against the land are rooted. Part of this is linguistic: When we use possessive words, like “my land” or “I will do”, it again, establishes a certain kind of relationship–one where I am the dominant force, where I have the control. I like to instead describe the land as “the land to which I belong.” Its subtle, but powerful, and helps shift the inner subconscious, not only for you, but for anyone else who hears you speak. And so, if we are going to establish any land as a sacred space, it begins in a place of partnership, respect, and conversation. Creating sacred spaces is a time-honoring, slow process; creating a whole sacred landscape is even more so the case. Like the flow of the seasons or the sprouting of a seed, this kind of work can’t be forced. 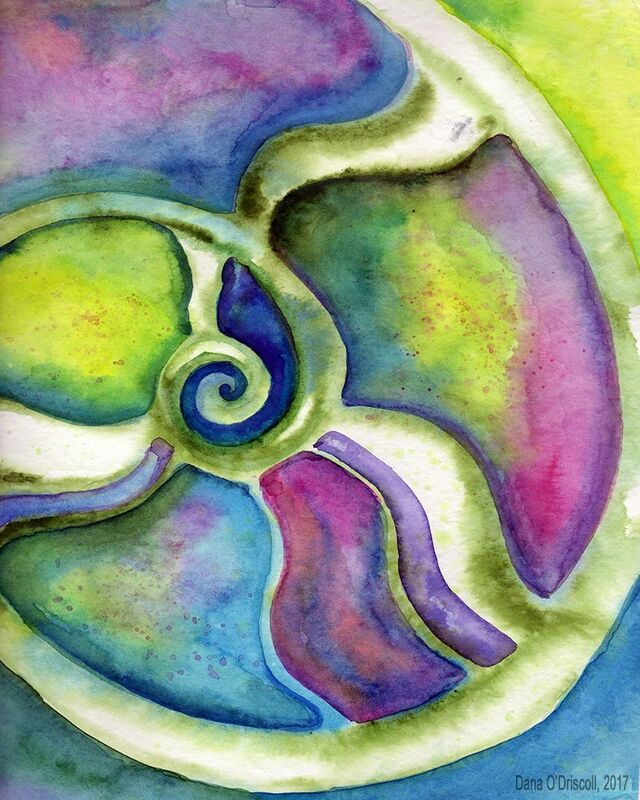 The work takes the time it takes, unfolding like a spiral. In honor of time and space, before you even begin to shape a shared vision of creating sacred land, there is preliminary work to be done. Think of this preliminary work like the foundation upon which everything else is built–your job, first and foremost, is to lay the foundation and prepare the site. And you do that through honoring and, in a lot of cases, some good old fashioned sweat equity. Before you even begin to shape a shared vision for sacred land, its important to acknowledge all of the folks sitting at the table: ancestors of the land, nature spirits, land guardians, the spirits of the stones, and the trees, and the like. There are a lot of different kinds of “spirits of the land” or “spirits of place.” Ancestors of the land, human spirits that once lived there and still guard/protect, may be present. Nature spirits, the spirits of the plants, animals, stones, and trees, may also be present. 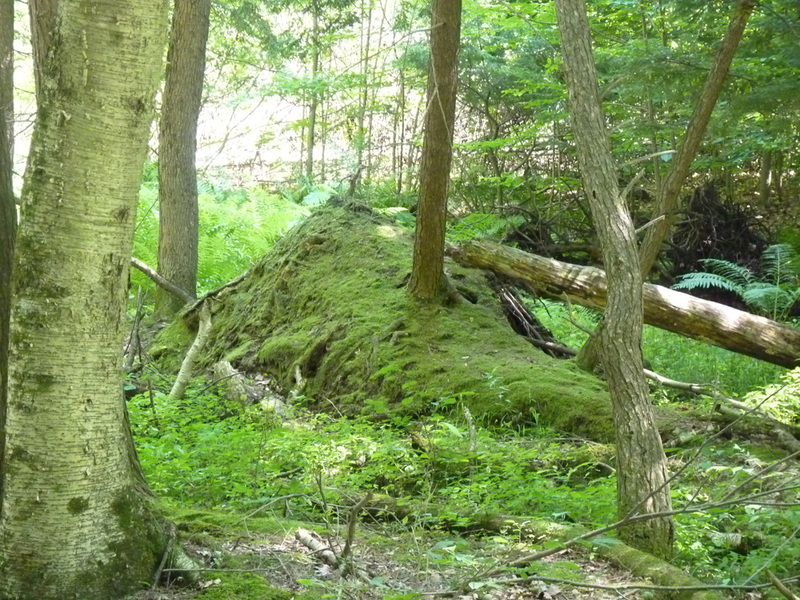 Greater nature spirits, like those of the soil web, the mountain, the river, the whole forest, may also be present. Even greater beings, like a land guardian or deity of some sort, may also be around. They want to be acknowledged and should be before any other work can begin. Honoring the Nature Spirits of the Land. For honoring the nature spirits of the land, I like to simply sit in stillness and quiet in a place on that land, and make simple offerings. When I arrived on the land to which I now belong, even before it was under my “ownership”, I brought some home-grown tobacco and my flute and played the flute and made offerings around the property. This was my sole purpose in the visit. I spent time on the land; I brought a blanket and lay in what may become a sacred grove down by the pond. I just breathed in the soil and observed the land around me. It was beautiful, magical. I could feel the spirits of the land stirring. Sometimes, the spirits have been asleep for a long while–and they need time to awaken again. This simple honoring work achieves that goal over a period of time. For honoring them long term, I highly recommend a dedicated outdoor shrine–this will be the first thing I build on the new land once I have a sense from the spirits of where to build it. Honoring the Ancestors of the Land. Ancestors come in many types. Here in the US, we have primarily two types–the more recent ancestors which may have been farmers, miners, and the like, and more distant ancestors of the land, who were the native peoples. For the native ancestors of the land, I am planning on a specific ceremony to honor them at Samhain. I will build a fire, drum, play my flute, offer my home-grown tobacco and simply be present to listen to their voices. After I have listened, I will share with them my hopes and dreams for the land. For the non-native ancestors of the land, who I know to have been farmers (thanks to those who lived on the property before me), I have indicated my intent to dedicate a bed in the garden in their honor. Building Trust. Even if you are stepping onto “well tended” land, most land today has been damaged by the typical practices of westerners: keeping lawns, spraying weeds, burning garbage, driving over the soil and compacting it, and the like. You may find yourself in need of doing some reparation work before you begin any spiritual work. This is because the spirits may need to learn to trust again. Before you can communicate with them, before you can create sacred land, you must pave the way and demonstrate your intentions. At my old homestead, I had to clean up the egregious garbage all over the place before I did anything else. That, and the honoring work, took me far in connecting to the spirits. At my new sacred land, I have the sense that I will need to do some seed scattering and forest replanting, among other things. Understanding the History of the Land. Part of trust building is learning, what you can, about the history of the land. If you have access to the previous owners, that is a good place to start. If not, you can look for signs on the landscape–old fence posts and barbed wire, for example, is a common sign in these parts. I think it is useful to use any tools you can–in the US, the US Geological survey also offers historical maps of many regions and that can help you get a sense, back into the 1950’s, of what the land may have looked like. Court records and deeds are also very common! This post has gotten quite long, so I’m going to go ahead and close for this week. In my next post on the series, we’ll continue into this work! This post is third of a series of posts on Druid Tree Workings–ways of connecting, communicating, and working with trees. In my first post on the series, I described finding the face of the tree. In the second post, I explained some “outer” techniques to working with the trees through using your five senses. In this third post, I’ll describe some “inner planes” techniques–that is, using intuition, knowing, meditation, and senses beyond our physical ones to communicate. These are the techniques of the spirit and the soul, the deep inner knowing, and allow us to go deeper into the Mysteries. One of my blog readers asked me in the comments of my first post on the face of the tree about how you know that the tree is speaking or trying to send a message on the inner planes. I’m going to start here, because this isn’t as straightforward as it may seem to people new to this kind of work. Many who work within a druid tradition (or other kinds of nature-based spirituality or esoteric studies) engage in practices that can help one be more open to the messages of the world–and these practices come in many forms. The absolute best and most necessary of these is regular meditation (and by regular, I mean daily or as close to daily as you can get). The reason that this forms the cornerstone of the work is that most of us don’t spend enough time managing our thoughts, directing them, or being in stillness. We have continual internal monologues that make it difficult to gain messages from anything out in the world. But daily meditation, especially in an outdoor setting, over time can allow us to be in a receptive state. I primarily practice discursive meditation, a western-style of meditation taught by the AODA that focuses on directing one’s mind rather than clearing it. John Michael Greer describes this in more detail in his Druidry Handbook, which I highly recommend. I also practice various mind clearing techniques such as counting one’s breath, mindfulness, and empty mind–all are useful for inner tree workings. Meditation allows you to clear your mind and remain focused in such a way that external messages can come forth. After you’ve practiced meditation for long enough that you have some control over the inner monologue and can quiet your mind even for brief amounts of time, go outside, and ask a tree if you can work with it (or go to a tree that you already have established a relationship with). Sit near the tree and simply quiet your mind enough to to attune to the tree. Don’t go in with any expectations–the tree may not be interested in communicating, or you may not be ready to hear. This practice may take weeks, months, or even years before you get results–but with regular meditation you WILL get results. Practice, openness, and patience are the keys to all good mysteries. 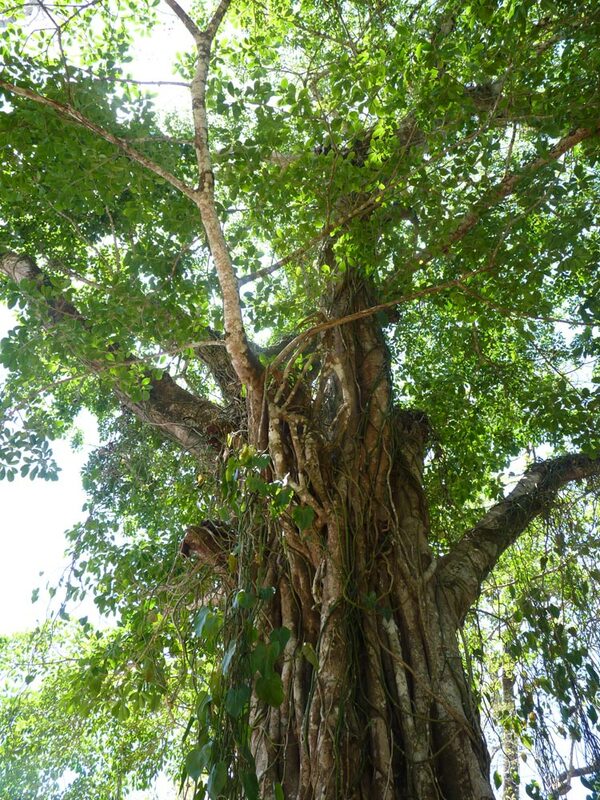 King of the Forest- A Tree in Costa Rica! When you do receive a message, the message can come in different forms. You may hear words, you may get a feeling, you may have a strong “knowing”, or you may see something in your “inner eye.” I have found that in training others to do this work each person has one kind of inner sense that comes easier than the others, sort of a default setting that we start with. Here’s what I mean–one friend has an empathic gift, so she feels everything–she goes into the forest and feels the energy of that forest strongly. Sometimes she sees lights and colors with her inner eye that blend harmonious patterns when the energies of a forest are pleasant. But for years, this friend never is able to hear verbal messages of any kind. Another friend is a strong verbal communicator–she often receives messages in her outdoor meditations and prayers; they are usually one short word or phrase. Yet another friend can have long chats with trees easily, especially when the spirit of the tree reveals itself to her on the inner planes (see below). So, this “default” way of communicating or sensing doesn’t mean the other forms of communication aren’t open to you, but it does mean that this method comes easiest and the other forms might take some work in order to use. These ways of communicating that come easy should be honed with meditation–like anything else, regular practice creates improvements. The challenge with inner messages is that they are just that–inner messages. The question is: how do we know an inner message we’ve received isn’t just in our imaginations, isn’t just our own minds playing tricks on us, isn’t just us talking to ourselves? I think its wise to always question what we are getting in any form. My mentors have taught this to me as an “outer plane check”; that is, we can and should see external confirmation of something sensed or interpreted internally. Here’s one such example: The face of the tree technique is something that I’ve been thinking about for a long time. After a series of meditations and observations, the concept continued to solidify in my mind. But was it just in my mind? A few months ago, while walking with two good friends in the forest, we came across a tree with an unmistakable face–a very human-looking face–and my friends both pointed it out –I didn’t have my camera with me that day, or I would have photographed it for this post! And we all commented on it and spent some time with the tree. I told my friends afterwards about the face of the tree theory and they were in complete agreement. So this experience served as one kind of “outer plane check” to my inner understanding. Here’s a second such example of an outer plane check, this one related to a body of water and a large rock. A friend and I went to a rock called “White Rock” which used to be a very sacred site for Native Americans; it is located north of Port Huron in one of the great lakes, Lake Huron. She told me she had intuition about the place and that we should go there, but told me little else. We arrived and both sat for a bit and simply listened. After sharing, we both had the same message–that we were to do a protective working there (we did AODA’s Sphere of Protection, an experience that I wrote about in the first issue of Trilithon: The Journal of the Ancient Order of Druids in America). The key here is that we sensed and experienced first, and then shared, and found strong commonality in our sharing. Outer plane checks don’t always happen so quickly however–sometimes it takes months or years to confirm messages received–but they do come. What Kinds of Communication Can I expect? I think one should be open for whatever messages come and go into a tree working without expectation. Most of the time, if a tree is willing to communicate with you, its for a reason–they aren’t much for small talk, I’ve found. In my experience, many trees have stories to share, stories they want humans to know. I’ve shared a few such stories on this blog. They may have a request, and it might sound odd (like taking a bowl of earth somewhere else, giving some water to a nearby tree, or spreading their seeds) but a request should be honored. Once you have spent some time establishing relationships, you will find that the trees can provide you with insights and advice; they are quite wise and will guide you as only an elder can. 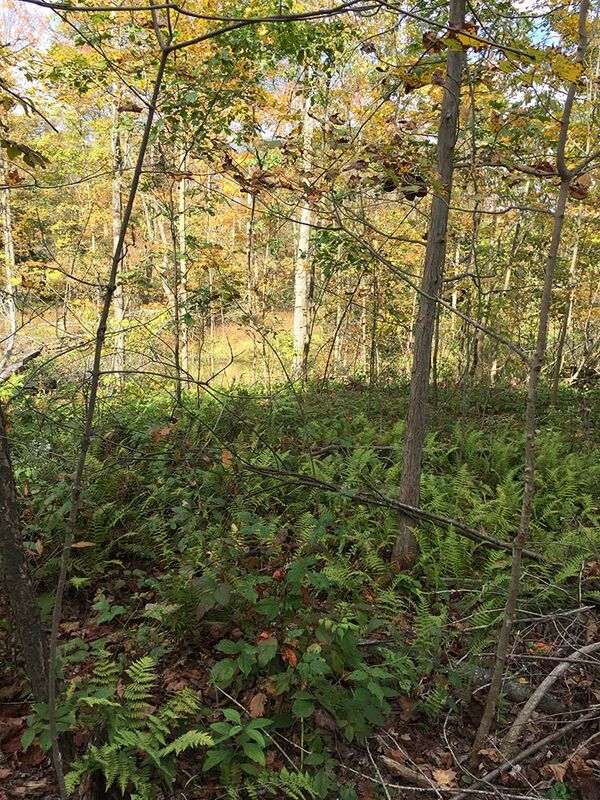 I recently had a very difficult decision about my future and life to make about whether or not I was selling my homestead, packing up my life, and moving to a new state (more on this soon)–and one of the things that were critical in helping me make the right decision were three conversations with trees on my property and woods. The trees helped me understand the decision in the context of some of my broader calling and work with the trees in the world, and they told me where my energies were most needed. They also gave me a sense of what was to come for my current home and land, and the gifts that I’ve shared. These conversations helped lift the burden of such a difficult decision. Trees also have ways of communicating with each other, sometimes over great distances. This is another important thing to understand–conversations with one may lead the way to conversations with others as you establish relationships with them. When you are building a relationship with trees in one place, in some sense, you are building it with many of that species, that region, and so on. 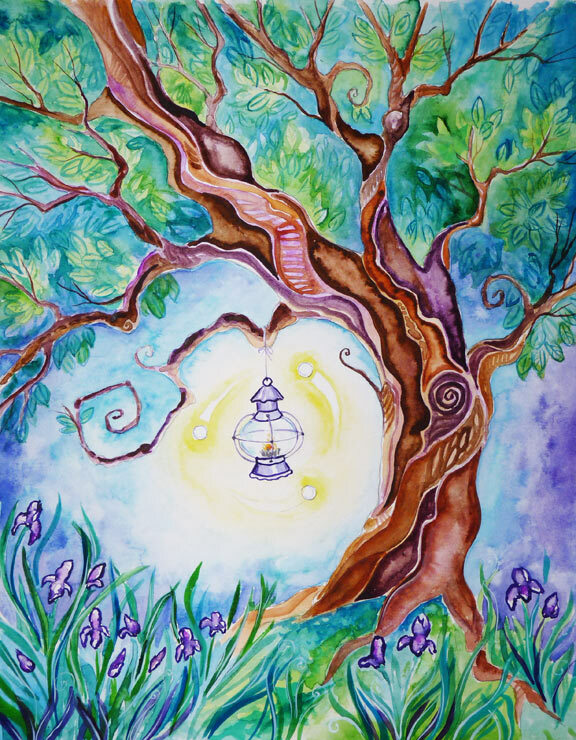 Some of the deep tree work done through mediation and working on the inner planes can be done by connecting with the spirit of a tree (and yes, they do have spirits). Go, sit a the base of a tree or hold a piece of the tree in your hand (if possible), work on connecting with it. If neither of these are possible, focus on connecting with the tree at a distance. You might be able to connect with the tree spirit–the soul that resides within a tree. I have found that species have a representative spirit, but you can also connect with individual tree spirits. In other words, there is a chief oak spirit, but also, each oak has its own spirit. Working with these spirits can be extremely rewarding and fruitful–many traditional western herbalists also talk about working with the spirit of the plant (or their plant ally). You can learn much from the tree by taking this approach. Another way to build relationships with trees is by honoring them through rituals and ceremonies. There are numerous traditional ceremonies, such as apple orchard wassailing, that honor trees in various ways. But within the druid tradition, you can also dedicate portions of seasonal celebrations to tree workings (or honor a different tree at each of the eight holidays). Some traditions (like OBOD) do build various trees into their ritual workings (for example, the battle between the Oak King and Holly King at the Winter Solstice). In addition to seasonal celebrations, I also like to do ritual work honoring my trees regularly–I use the Gnostic Celtic Church‘s communion ceremony as a land blessing fairly frequently. I also have a small ceremony that I do to bless new trees when I plant them. 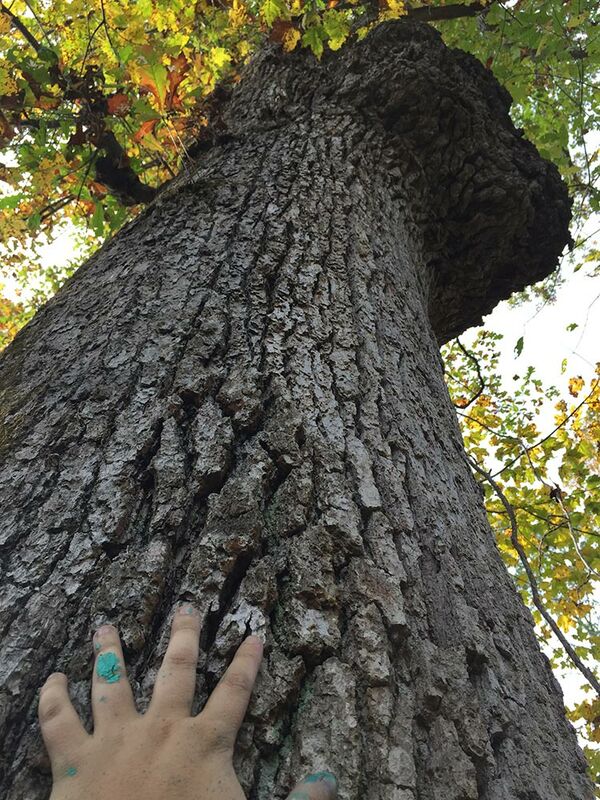 These small ways of honoring the trees in a sacred manner do much for inner relationships with trees. I’ll end this post with a statement on the relationship between inner and outer work. If you want the trees and spirits of the forest to take you seriously, you must take the work seriously. This means dedicating time and energy to the work, of course, such as honing your skills through regular meditation. But there is another piece to this, and it is best expressed through the the old Hermetic adage, “As above, so below. As within, so without.” While this adage applies to any magical work or transformation work, it most certainly applies to tree workings. In the case of tree work–if you want to cultivate positive relationships with trees, really deep relationships, you must look at your other behavior and living in the world and what energies you are cultivating and allowing into your life. If one is heavily into consumerism, greed, materialism, and other things that damage and destroy nature, the trees know it. We carry that energy with us….it pervades everything that we do; it works its way into our auras, and any advanced spiritual worker or nature spirit can sense it. By making shifts in our outer world, we open ourselves up in the inner worlds for deeper connections…this point cannot be stressed strongly enough. But this work goes the other way too–as we transform ourselves with the help of the trees, the outer consumerism and materialism becomes less and less important. 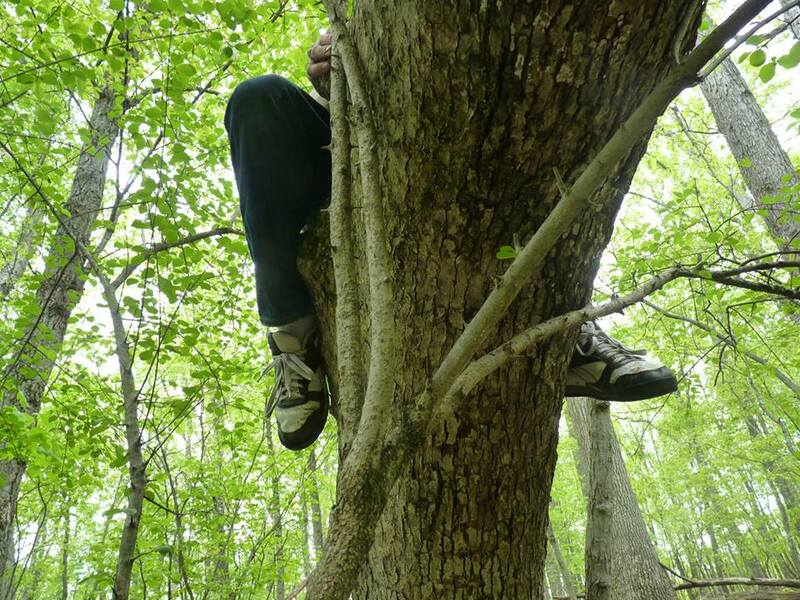 Tree climbing = one great way to commune! The trees themselves present much in the way of mystery teachings. This second post in my “Druid Tree Workings” series explores various methods for listening to the voices of the trees and developing methods of communication, like finding the face of the tree. These are various approaches that I have learned to use over time–and most have arisen through my intuition or have been taught as mystery teachings by the trees themselves. This is my second post, on “outer” messages from trees–that is, messages that re physically present in the world around us (I will follow up this post next week with “inner ” messages). Basic Courtesy when Working With Trees. I think that one of the greatest flaws inherent in our current society is the lack of respect for the sanctity of life that is non-human in nature. People see a forest and they think about how they can profit from it and rarely respect the right that that forest and its inhabitants have to life. As long as one engages in the world with such an attitude, one will get little meaningful response from the trees. So, one of the basic ways we can respect all life, and build a relationship with it, is by recognizing its inherent personhood. While this may be a radical idea to some, this animist philosophy has guided my thinking and spiritual work with plants, trees, animals, insects, rivers, and so on. And so, the idea is that you treat the tree with the same respect and courtesy that you would when approaching a human you don’t yet know–you wouldn’t just lean up against them or pull a piece of their hair. Ask what, if anything, does the tree want in return. I wrote about sustainable offerings before and suggested offerings might be way more extensive than just a little bit of food or wine. Traditionally, tobacco, corn paho/corn meal is a common offering in the Americas, but may or may not be appropriate for you to give. Once you have permission, sit and commune using any of the techniques below. Finding the “messenger trees.” Sometimes, when you enter a forest, you may come across what I call “talking trees.” These are trees whose branches or trunks rub up against themselves or other trees, and when the wind blows, they creak and bang. These are the messenger trees, communicating audibly so that others can hear. I would suggest starting by finding such trees if you can, as they often have much to say, and may be appointed “speakers of the forests.” Listen audibly to their creaking, sit at the base of their trunk and let the creaking reverberate through your body. Put your ear to the trunk and hear the creaking through the tree. Listen, also, with your inner senses, and hear what they have to say. This method of communication obviously works better when there is wind. Hearing the song of the wind. Another way to audibly hear a tree’s message is to listen to the wind and how it blows through the leaves, needles, branches, and so on. While you can do this standing anywhere near the tree, I find this works best when you can put your ear up to the bark and hear the wind blowing through the trees, the banging of the branches. Pay close attention, too, to the direction of the wind and its interaction with the tree. Pay close attention to what happens when you ask a question (either internally or spoken aloud). Putting your Ear to the Tree and hearing “tree echoes.” A third way to audibly hear a tree’s messages is through putting your ear to the trunk of a tree on a windy or semi-windy day. Make sure your ear gets a good seal–so this is often easier on younger trees or those with smoother bark like beech or maple. What you will hear is based on a few factors. 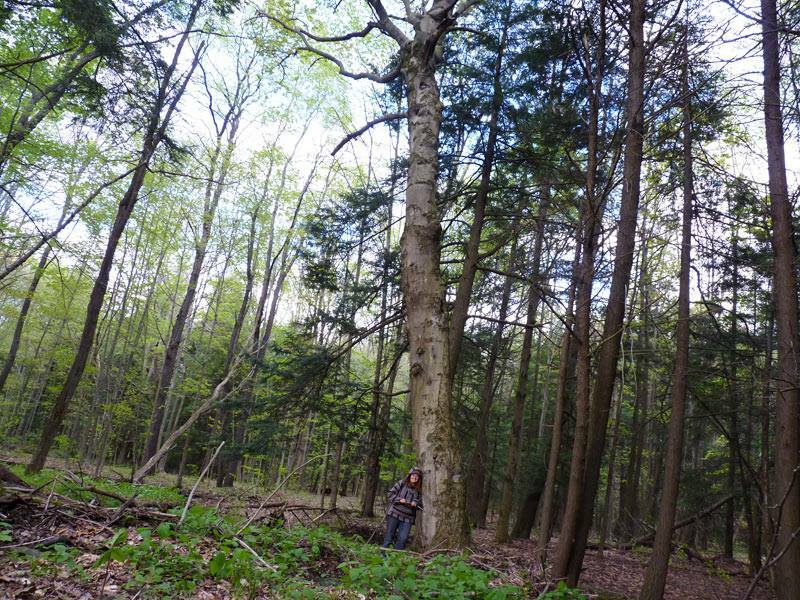 First, what you hear will change based on the tree itself–the different wood density between species creates different reverberations; the size of the tree also matters for hearing the tree echoes. The amount of wind, too, will determine what you hear. Finally, deciduous trees sound different depending on the season–bare branches bang against each other in ways that leafed out branches do not. The “tree echoes” have their own kind of music and can be quite pleasant, depending on the tree and the day. Seeing the patterns of light and color. An easy way to see a tree communicate is to watch the wind and leaves in its branches, to watch the patterns of light and color play out on the forest floor. In the fall just around Samhuinn, you can walk through the forest in my region and discover the most beautiful patchwork pattern of fallen leaves and colors. All of these things have messages to share for the intuitive observer. Understanding Trees and Timing. To speak with the trees, you also need to pay attention to the time of the year. 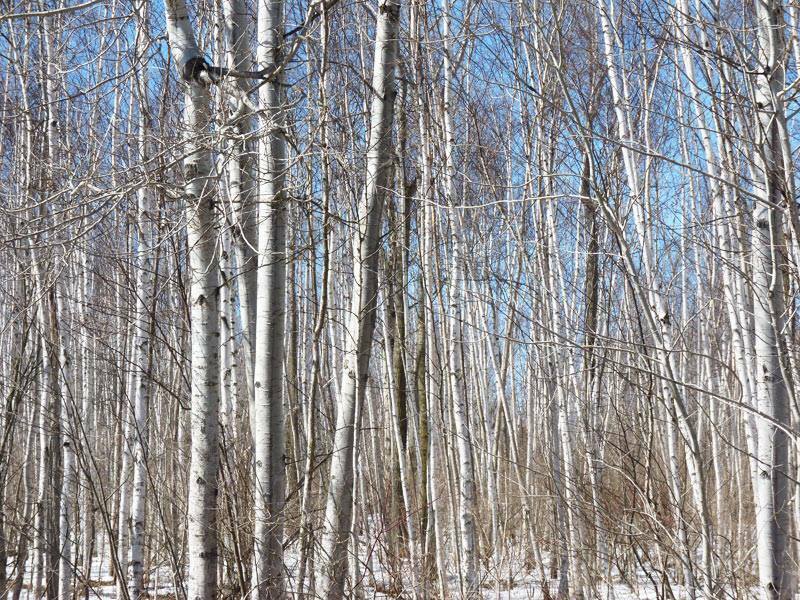 I have found that some tree species are most active and engaged when the sap is running in the late winter/early spring or when they are in full foliage in the summer months. As winter approaches, all of the trees, even the conifers, slow down a bit. You can’t do much to commune with deciduous trees in winter—they are at rest, their roots growing deep, their energies focused on the telluric currents of the land. The confers, however, can still be worked with during this time. In fact, some Native American legends, including those of the Seneca people, tell that they conifers stay active all winter to hold the winter at bay. The myth goes that by keeping their needles on, the conifers, led by White Pine, defeat winter and ensure spring’s return. One conifer tree, the tamarack pine, was weak and lost his needles in the winter. However the mighty oak, who holds his leaves till the spring even though they are brown and rattle in the wind, takes tamarack’s place and joins to aid in the battle for spring. My experiences in working with the trees are quite consistent with this legend. You can easily work with the conifers and the oaks during the cold winter months–the rest will likely be slumbering till their sap begins to run (in my region, Zone 6a in South-East Michigan, they usually slow down by Samhuinn and return around the Spring Equinox). 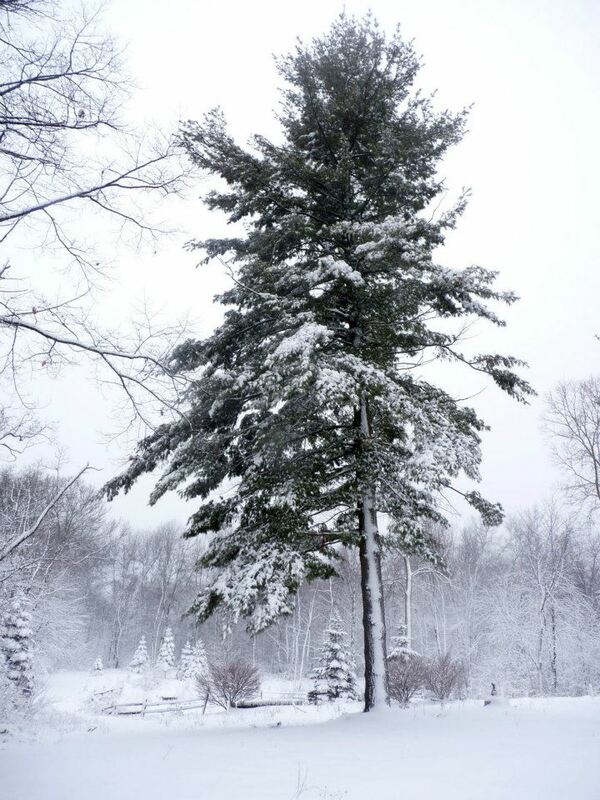 White Pine: Chief of Standing People–holding the winter at bay gracefully and powerfully! Hail the white pine! Tree Observation and Sensing. The final way of communing with the trees is a simple act of observation and using your five senses. Get close to the tree-see how it smells. Stand out with a tree during the rain–watch how the water runs down the trunk, gets into the cracks, creates little bubbles, and softens and soaks bits of moss growing in the trunk. Look at the tree in moonlight, in sunlight, in fog. Observe the branches and leaves up close and far away. Notice the patterns that the branches grow out in, how thick they are, how twisted or straight. Notice any effects the landscape has on the tree and its root systems (like wind, a cliff, etc). You can learn so very much in this simple–and yet profound–act. Visit the tree every day for a year, observe it in all its seasons and in all weather, and simply get to know it. With these techniques, long-term friendships can develop with trees. There are trees that I go to when having a good day; trees that I visit when my day is bad and I’m in need of healing. In my next post in this series, I’ll explore various “inner” ways of working with trees as we go deeper into the tree mysteries.